If you are looking for good night sleep tips read this short article - it may be all you need to finally get a good sleep. If you want an extensive list of good night sleep tips read what to do if you can't sleep. If you are finding it almost impossible to maintain an inner sense of peace, it usually means that stress is knocking on your door all too often. Everyone experiences stress from one source or another - too much work, too little sleep, relationship problems, money troubles. Due to worldwide economic uncertainty, we are living in particularly stressful times, when financial concerns are on most people's minds. Feelings of anxiety and losing sleep are common side effects that end up creating susceptibility to even greater stress and possible health issues. Sometimes you want immediate relief from a stress-filled day or help getting to sleep. When it comes to your health, choosing a natural solution is always the best choice for your body. Herbs have a long and successful history of being used in remedies for the treatment of anxiety and insomnia with little or no side effects. Medications that are thought of as "magic pills" to make a person happy, calm or sleepy usually have harmful side effects and are often addictive. Whenever you need it, a natural source of composure is within reach. 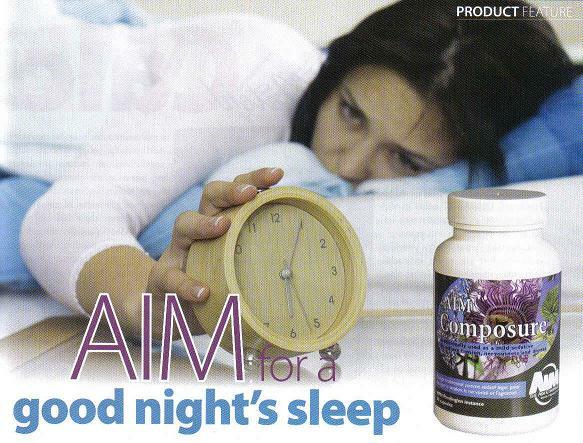 AIM Composure® NPN 80007112 is a combination of three soothing herbs that relax and calm nerves, reduce feelings of anxiety, and promote restful sleep. For centuries, valerian root, passionflower and hops have been used individually in the treatment of anxiety and insomnia. Each of these herbs is approved in the Natural Health Product Directorate Monographs from Health Canada. The research and development of Composure led to a time-tested formula from The Complete German Commission E Monographs that blends all three botanicals. This herbal trio works together synergistically - providing even greater benefits than when each botanical is taken alone. When peace of mind is elusive and stress is taking its toll on your nerves and sleep patterns, Composure can help. Valerian root can take the edge off of a stressful day and help you to relax naturally for a good night's sleep. Passionflower relieves muscle tension and soothes a troubled mind so that when your head hits the pillow, a night of rest will follow. Hops flower has been used to treat anxiety and insomnia for more than a thousand years, so you can count on its effectiveness. The times we live in are worrisome indeed. Even though we are all facing more apprehension and stress, it does not mean that we have to suffer the physical and mental effects. Make sure that you are eating well and getting some exercise regularly. And for those times when you need extra help in relaxing or falling asleep, look to Mother Nature's garden for the solution ... Composure - a safe and effective way to relax and calm nerves, reduce restlessness, and get a good night's sleep.